Satyagraha ( Sanskrit: सत्याग्रह; satya: "truth", āgraha: "insistence" or "holding firmly to") or holding onto truth  or truth force – is a particular form of nonviolent resistance or civil resistance. Someone who practices satyagraha is a satyagrahi. Assessing the extent to which Gandhi's ideas of satyagraha were or were not successful in the Indian independence struggle is a complex task. Judith Brown has suggested that "this is a political strategy and technique which, for its outcomes, depends of historical specificities." The view taken by Gandhi differs from the idea that the goal in any conflict is necessarily to defeat the opponent or frustrate the opponent’s objectives, or to meet one’s own objectives despite the efforts of the opponent to obstruct these. In satyagraha, by contrast, “The Satyagrahi’s object is to convert, not to coerce, the wrong-doer.”  The opponent must be converted, at least as far as to stop obstructing the just end, for this cooperation to take place. There are cases, to be sure, when an opponent, for e.g. a dictator, has to be unseated and one cannot wait to convert him. The satyagrahi would count this a partial success. 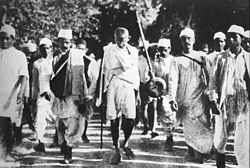 Civil disobedience and non-cooperation as practised under satyagraha are based on the “law of suffering”,  a doctrine that the endurance of suffering is a means to an end. This end usually implies a moral upliftment or progress of an individual or society. Therefore, the non-cooperation of satyagraha is in fact a means to secure the cooperation of the opponent that is consistent with truth and justice.
" A Letter to a Hindu"
" Raghupati Raghava Raja Ram"